WordStar, shown here running on a Kaypro IV, was the word processor of choice for a number of early adopters. 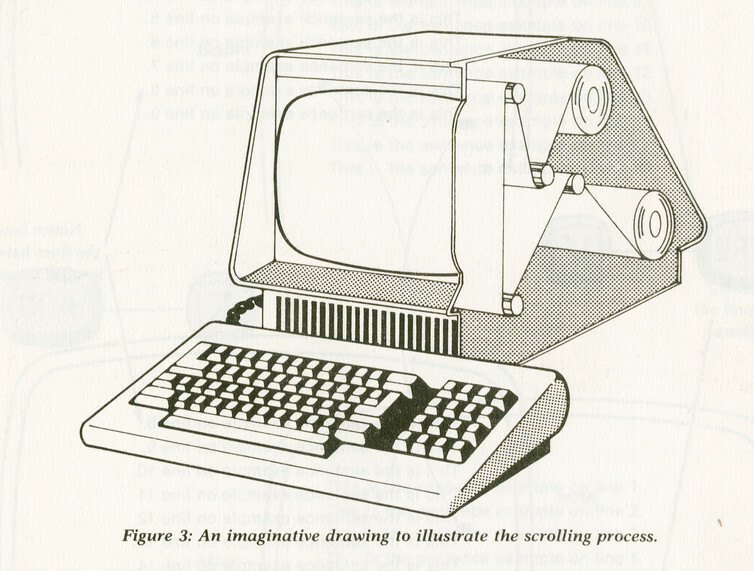 This illustration from an early word processing manual sought to reassure anxious authors that their prose was still there, even after it had scrolled off the edge of the screen. This article was originally published in The Conversation and is reproduced through a Creative Commons license. Chris Meadows last month wrote a great post commenting on Prof. Kirschenbaum’s findings, but I thought it would also be fun to publish the professor’s own words. An aside: I myself wrote my first book, The Silicon Jungle, on a Kaypro 2 in the 1980s, while using WordStar. So the view in the photo at the top very much appeals to my nostalgic side. Meanwhile thanks to Michael Perry, a frequent TeleRead commenter, for calling my attention to the Kaypro angle. “But for word processors,” says Michael, “I don’t think I would write. Revision would be too much work.” – D.R. This is a fascinating topic and one that I hope to see expanded upon in future. There are so many tributaries yet to be explored. For example, we know that the advent of the “talking picture” had a profound impact upon filmmakers as did the later development of color and computer graphics animation. Will something similar happen to book writers as their computers enable new ways to express themselves as well as improve the working of their regular stock in trade? Back in the late 80s, I had the privilege of observing graduate students adapt to TTY displays initially only to have that achievement disrupted upon the emergence of HTTP and the world wide web. This was a BBS dedicated to helping then very isolated in-service teachers continue their professional development and become better prepared in their teaching. My grad assistants adapted to keyboards and 80 column monochromatic text fairly well. Their task was to seek out and transform information to be more immediately useful to this audience. Collectors of content and purveyors of pedagogy. The transition to the web was more difficult because we suddenly had more expressive tools than we could quickly make effective use of. The dance of acceptance, rejection and re-connection was long, complex and idiosyncratic. For example, we had a server side tagging system that enabled us to display text and other things conditionally (time of day, web browser, operating system and a bunch of other stuff. We never imagined being able to write something that would change to reflect the hour, day, season or year. That experience definitely changed the thinking and consequently the writing of everyone who was involved. I can’t speak for published authors, but I remember (long ago) writing first drafts of college papers, short stories, and even an attempt at a novel with pencil and paper. When I wanted a “finished” copy to submit for class, I used an electric typewriter for the second draft. In later years I bought a computer when I wanted to try my hand at submitting stories to magazines. All things subjective, I think writing was more vivid, more complex, more alive when pulled from the brain with pencil and paper. The computer made writing less complex and engaging, though easier to revise, and it seemed more sanitary and lacking verve. If I had to hazard a guess, I think writing by hand engages the writer to write better with more care on the first draft whereas the computer allows the writer to write out the first draft much quicker with the idea of revising later. @Greg: Thanks for your thoughts here. But each to his own. In my opinion, computers have made writing more engaging. I hated the scissors-and-whiteout hassles. Better to be able to focus on what I actually have to say. You’re trying to compare two activities that are all too often a painful chore. A word processor built around office activities wouldn’t count for me in this context; it’s only when the tools impact the writing project that such a study may become interesting. For example, I’d expect many author’s lives to have been blessed by tools like Scrivener, and blighted by the likes of Office, but that’s just a personal observation. David, thanks for adding your reminiscences; I came across Silicon Jungle during my research, and found the Arthur C. Clarke section especially valuable. @mkirschenbaum: Delighted that the ACC section helped. And thanks for writing your own book and helping to keep alive the old memories. Later this year, if all goes as expected, The Silicon Jungle should be available in a public domain edition by way of Distributed Proofreaders and Project Gutenberg. My hope is that you’ll go on to write a definitive history of ebooks—covering everything from user experiences over the years to evolving technology, the effect on the lit scene, copyright, existing business models and hoped-for business models. I myself continue to root for the creation of a national digital library endowment.